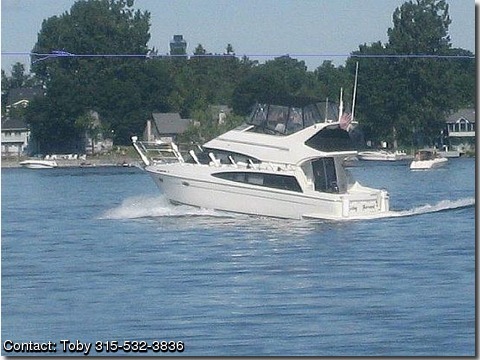 Contact the owner Toby @ 315-532-3836 or toby1@twcny.rr.com.Beautiful boat with low hours. weekender with all the amenities. double that converts into two twins in guest room. Double recliner in salon with TV and large dinette. has the feel of a small condo inside and out. an abundance of storage space. this boat can move with a top speed of around 45mph.